The open, inviting lobby with one floor of the striking bookshelf. All photos courtesy of Amastan Hotels. 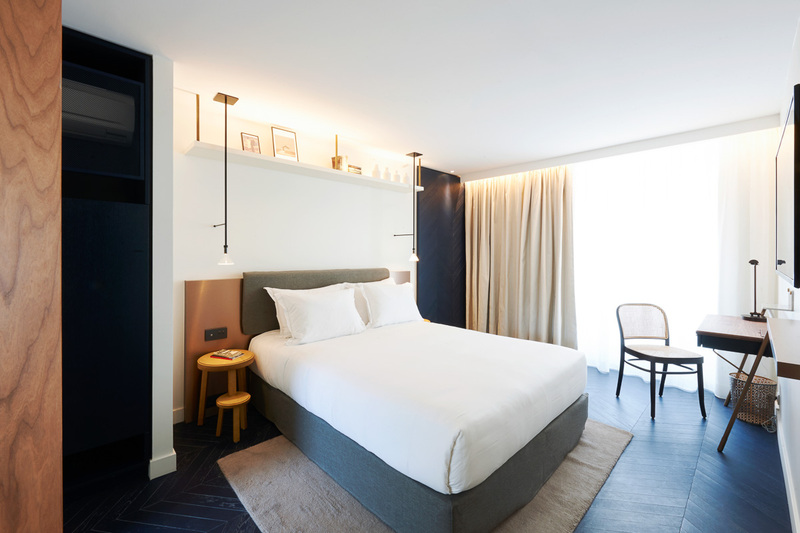 The newest hotel on the block, Amastan Paris, finds the perfect balance between classic and modern — the luxury of a contemporary atmosphere in the old-school 8th arrondissement. 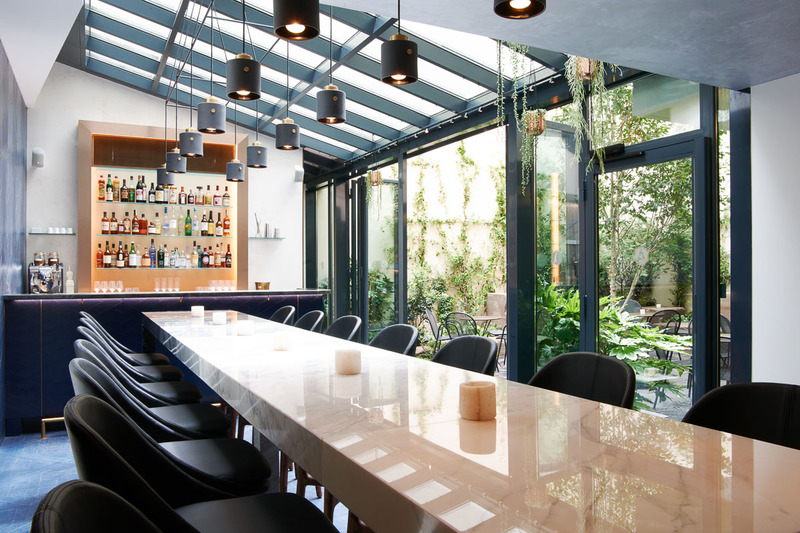 Three years in the making, boutique hotel opened its doors this week in the chi-chi 8th arrondissement a stone's throw from the Champs-Élysées, bringing contemporary edge with a younger vibe and friendly service to the old-school neighborhood. Just how new is it? The website is still under construction as we publish this. Twenty-four minimalist and serene rooms, several with balconies overlooking a quiet courtyard, are spread over six floors. 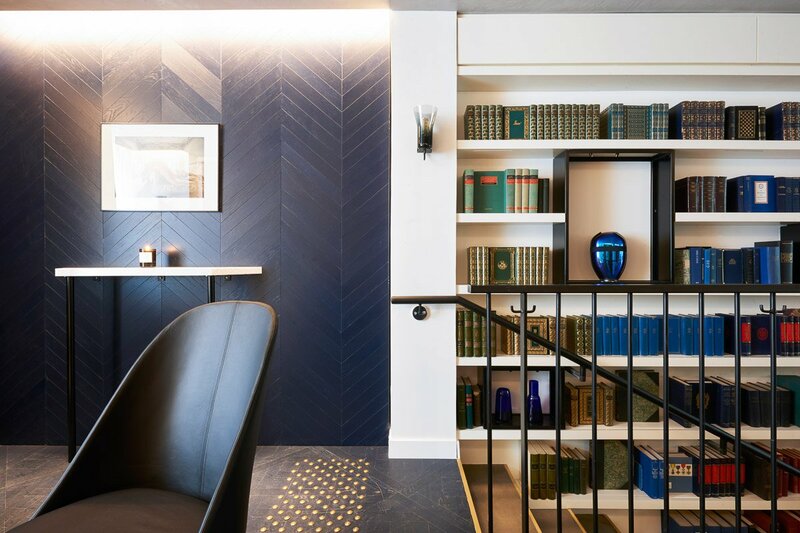 Design studio NOCC filled the hotel with original art and striking elements like blue herringbone parquet floors in the public spaces and a handsome two-floor library wall. A custom tapestry in the lobby by designer Jan Kath hangs from the wall and covers the sofa. Anouk, the bar and nightspot, is already drawing a cool crowd. In addition to an impressive array of cocktails the menu includes light snacks. Anouk has a separate street entrance and opens onto a pretty interior garden. Amastan has also created Pop-In. The permanent pop-up space in Paris, it will feature emerging designers and talents, starting with jewelery studio URiBE and fine artist Justin Morin. Jan Kath's custom ceiling-to-floor tapestry in the lobby. Light abounds throughout the hotel. This is the first hotel by the new hotel brand Amastan, and more are in development. 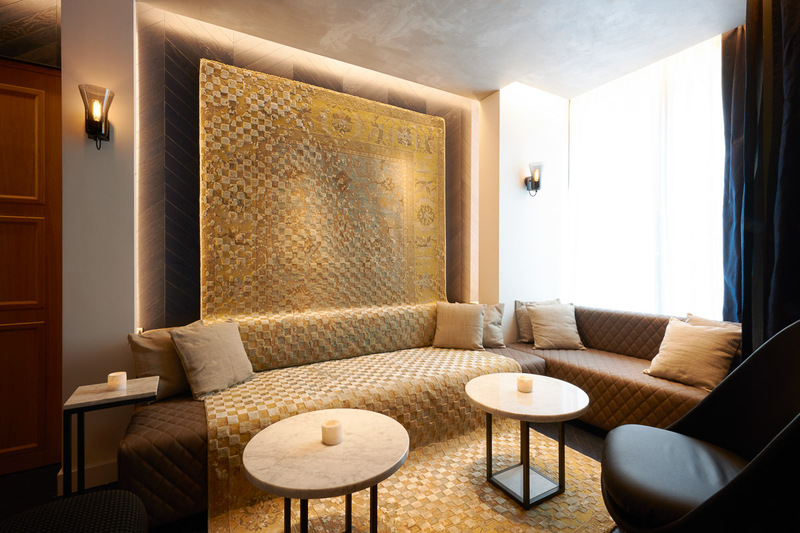 Founder Zied Sanhaji is attempting to bring great service without attitude and a hip, cultural vibe to the neighborhood. "Our aim is for our guests to feel like themselves, as though Amastan belongs to them and not the other way around." Amastan serves some of the best hotel food I have ever had. They source great ingredients, and serve it to fit guests' needs — at Anouk, on the terrace, or in the rooms. The dinner I had on my balcony was delicious: cold pea soup, prosciutto and melon, and steak with an unusual mushroom side and fresh salad. Breakfast was scrumptious: delicately cooked eggs, fine fruits, strong tea, and refreshing juice. As a bonus, the waiter was particularly charming. My room felt like a suite, with a sunny balcony, a vast double bed, beautiful custom wood furnishings, and a luxurious marble bathroom with products from Swedish brand Sacha Juan. Minimalist furniture is offset by the blue parquet floor and walls. Anyone looking for an unbeatable location, cool design, a younger vibe, quiet comfort, and American hospitality. Anyone interested in total anonymity. The hotel is located midway between the Arc de Triomphe and Place de la Concorde. 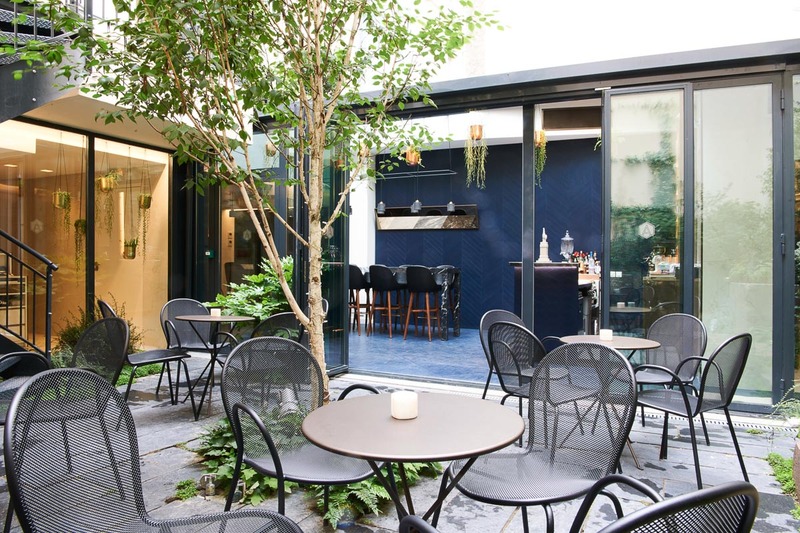 Rue Jean Mermoz, which links Rue du Faubourg Saint-Honoré (fashion central) and Champs-Élysées (tourist central), has a nice selection of restaurants and provides quiet respite from the bustle nearby. This side of town is old-school Paris at its best. Great museums like Grand Palais and Petit Palais are within spitting distance, and the Tuileries Gardens are just a little farther.